Jackie comes to us with two years of aesthetic experience. 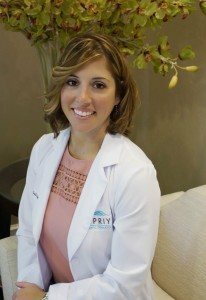 She is excited to be a member of the Supriya Dermatology team and incorporate her knowledge of medicine with the dynamic approach of dermatology and aesthetic medicine. Originally born in New York, Jackie moved to South Florida with her family when she was young. She graduated with her Bachelor’s degree in nursing in 2007 from Palm Beach Atlantic University. After graduating, she began her career as an RN at St. Mary’s Medical Center,. working primarily with the Pediatric Oncology and Neonatal Intensive Care departments. Jackie returned to school to pursue a Master’s degree in 2010. She graduated as a Board Certified Family Nurse Practitioner in 2013 from Florida Atlantic University. Jackie lives in Palm Beach Gardens with her husband and son. She enjoys exercising by way of running, weight training, and practicing yoga. She also loves spending time with her family and has a passion for cooking. Masters of science in nursing from Florida Atlantic University. Injectable Fillers including Radiesse, Voluma, Restylane, Belotero.